Dobre doshli v Burgas - Welcome to Burgas! It is a real pleasure to be here, in what is not only Bulgaria’s largest cargo port, but also a major hub for seaside tourism. For millennia, seas and oceans have connected us humans with each other. I believe it was the medieval Bulgarian writer Yoan Ekzar who observed that “the Sea is what brings together all that is far away”. And it is in that spirit that we have travelled from all corners of Europe to meet here today, on the shores of the Black Sea. And this year's Maritime Day marks a defining moment for the Black Sea region. This morning – with the support of the Commission – ministers from all Black Sea coastal countries and Moldova endorsed a Declaration that will pave the way towards deeper and more structured cooperation on maritime affairs. Our goal is to develop a common agenda, with specific actions and priority projects, shared by all countries around the Black Sea. Other sea basins like the Atlantic are already benefiting from having such a shared work programme in place. We hope to adopt one for the Black Sea under the Romanian EU Presidency next year. We are also making significant progress in fisheries. Last year, for the first time ever, countries around the Black Sea agreed on a multi-annual plan to manage a shared fish stock - turbot - together. Next week, ministers will come together in Sofia to adopt a declaration setting out a 10-year plan to make fisheries and aquaculture in the Black Sea truly sustainable. And it’s not just politicians who are getting together to push maritime cooperation in the region forward. Yesterday, scientists adopted a draft research and innovation agenda for the Black Sea. They remind us of the important role the scientific community can play in keeping alive the vital links of cooperation between countries in this region. So the stage is set. I truly believe that the Black Sea is ready for its own ‘Big Bang’ for sustainable blue growth. In the European Union, the blue economy already generates more than 500 billion euros a year. That’s roughly 4% of our total economic output. And over the past decade, several EU Member States have seen their maritime economy grow faster than their national economy as a whole. Bulgaria, by the way, is one of them. Looking to 2030, this trend is set to continue. This applies to exciting new areas like clean shipping, underwater robotics, and the blue bio-economy. But more established activities like aquaculture, cruise tourism, and coastal protection are also projected to grow. So are sectors like ports and logistics, driven by the global megatrends of digitisation and big data. The European Union is now focusing on what we can do to get money flowing into these promising areas. Two weeks ago I had the pleasure of opening Blue Invest, our first ever match-making event between ocean entrepreneurs and the financial community. I have never seen so many business contacts being exchanged in such a short time! Our focus on investment is not new - as those of you who joined us for the last few editions of the European Maritime Day will remember. As you know, EU money from various pots is already making a difference. Here in the region, Bulgaria and Romania have joined forces to create new tourist packages, allowing intrepid divers to explore millennia of underwater archeological heritage. A Bulgarian company called Sea Harmony is building artificial reefs for sustainable aquaculture, combining ecological benefits with economic activity. Another Bulgarian company is using EU money to develop solar-powered, zero-emission boats. But public money cannot fund everything - nor should it. Capital from private sources is just as, if not more important. And when it comes to raising such capital, we still see an investment gap. This is especially true for early-stage projects in emerging sectors like biotechnology, ocean energy and digitisation. Sectors with the biggest potential, but also the biggest risk. So we have refocused and sharpened our approach. More than ever before, we are using public money to boost private investment. Our next rounds of blue growth calls under the European Maritime and Fisheries Fund will stimulate more outside investment by combining EU grants with third party financing, giving successful applicants the best of both worlds. And we are building a European investment platform dedicated solely to the blue economy. This platform will mentor and coach projects that are not quite there yet, and help them access new sources of blended loans or equity. But with our economic opportunities come environmental responsibilities. This is particularly true for our oceans which are the blue economy’s underlying natural capital. At last year’s European Maritime Day in Poole, I announced that the European Commission was planning a new strategy on plastics, as part of our broader work in moving to a more circular economy. This Strategy was launched in December. Since then, we have also proposed changes to the Port Reception Facility Directive, to make sure that ports are ready to receive waste collected at sea. And just last week we proposed new rules specifically targeted towards single-use plastics and lost or discarded fishing gear. All of this will hopefully allow us to cut the inflow of plastics to the absolute minimum. We want the blue economy to take off. But we also want to keep our beaches clean and our oceans litter - and pollution-free. A morning of activity lies behind you. A rich and interesting programme lies ahead. Thank you to all of you who are contributing to this programme - whether it’s by organising workshops, presenting your projects or hosting a stand in the exhibition area. I wish you all a very rewarding EMD experience. 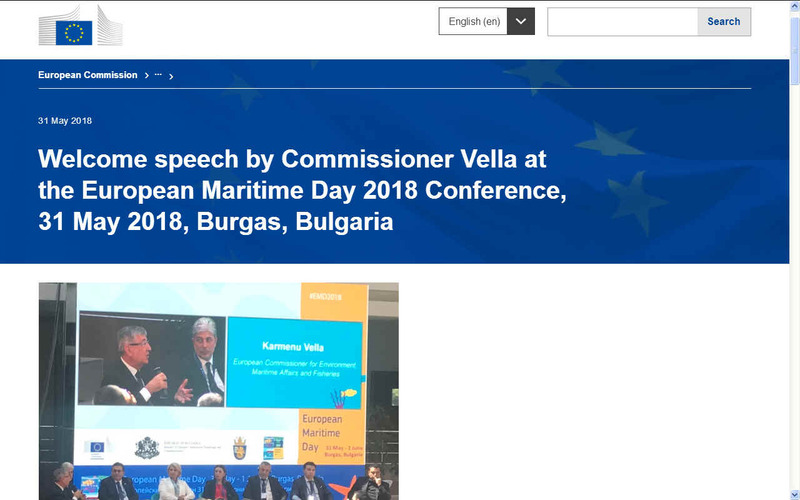 BURGAS MAY 31 2018: Karmenu Vella giving the opening speech at the European Maritime Day in Burgas, Bulgaria. Copyright © photograph May 31 2018 Cleaner Ocean Foundation. Europe and despite their other short-term differences, Britain have both put their money where their mouths are concerning ocean plastic in particular. That is a tremendous start. But the problem is bigger than Europe, it is an international problem that requires an international effort to beat back the tides of waste that are killing marine life and threatening food security. The oceans are really one, all joined and constantly transporting waste from one side of planet earth to the other. This is why the Cleaner Ocean Foundation has become involved, with the aim of bringing together heads of state who want to tackle this problem head-on and then to help them cooperate as efficiently as possible to find and implement a workable solution. Simply put, there is no point countries cleaning just their patch because it will soon be spoiled again by a neighbors dirty habits as tides and currents wait for no man. We are all responsible for what is happening. Those with the ability to put the matter right owe it to those who do not to act positively to protect their neighbor's interests regardless of political differences. If that means assisting countries around the world to recognise the problems on their coasts, then that is one of the targets. For once enough Governments join forces anything is possible, especially with potential solutions like SeaVax on the horizon - where in order to make it work we need global coordination and collaboration working independently on this one issue as brothers united in the war on plastic. QUESTIONS ANSWERED: Karmenu Vella is sitting here with Bernhard Friess who chaired the question and answer section before the lunch break on the 9th of November 2017. 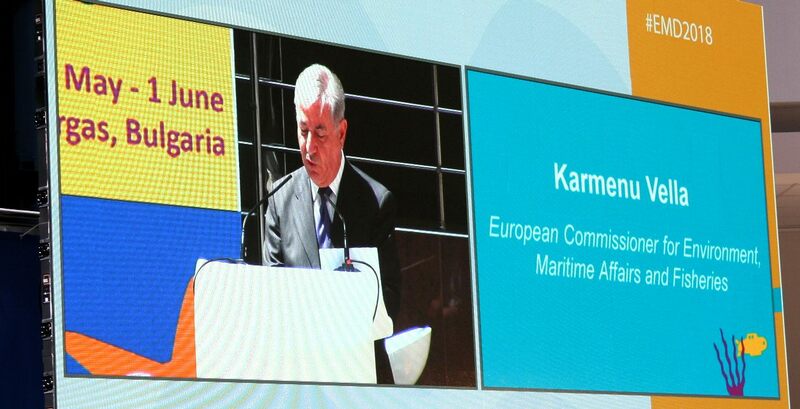 Bernhard is the Director of Maritime Policy and the Blue Economy DG MARE. Read Commissioner Vella's inspiring speech in Bonn on the 11th November 2017.